Glass cutting systems can produce quality cut glass for fusing, stained glass or mosaic glass work. Glass cutting systems are generally composed of a system of guides and stops fitted to a waffle grid work surface. They may have an inbuilt glass cutter or rely on the use of a normal glass cutter. These systems allow the user to consistently produce the same shapes once the dimensions are set. They can produce strips, diamonds, triangles, squares and other geometric cuts. One particular brand is able to produce various shapes and curves, which suit a wide range of stained glass, fusing glass and mosaic patterns. 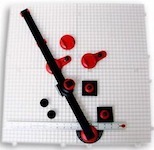 These glass-cutting systems will enable you to cut accurate sizes and shapes each time. When shopping for a system you need to be aware that some of the basic systems may not include the waffle grid, which has to be purchased separately, or you can purchase a complete system including the grid. I currently use the Morton Glass Shop for cutting pieces for my fused glass jewelry as well as cutting for general glass fusing. I have found it to be a very good piece of equipment, easy to use, it is the first one I will detail for you. The Morton system comes with a pivoting 22” cutting bar, bar locks, ruler, glass stops, angle gauges, angle copier, audio cd and other attachments. It can be mounted on either a Morton Maxi or Super Mini waffle grid surface. The super mini surface is supplied with a 15’’cutting bar. The system is designed to use your own glass cutter. An additional circle and border kit is available as well as a small circle kit. The small circle kit will also allow you to produce small curved pieces. The Glass Shop produces a wide range of geometric shapes such as diamonds, squares, triangles,trapezoids and strips that can be used in stained glass, fusing glass or mosaic glass projects. Repetitive cutting is a feature of this type of cutting set up. Stained glass artists find the range of shapes particularly useful. Further information on the Portable Glass Shop can be found at Delphi Glass. The complete Beetle Bits system has received good reviews. Similar to the Morton it is designed to cut geometric shapes. 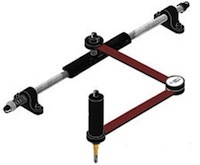 The cutting system features a simple set-up with a pivoting quick compass guide, 18" cutting bar ruler for precise cuts, 2 multi-directional glass stops, 23" straight edge and rest, 2 adjustable angle rests and an oil well. It has an attached Toyo glass cutter and a waffle grid surface. It also produces a wide range of shapes suitable for stained glass, fusing glass and mosaics. Further information on the Complete Beetle Bits Starter System Kit can be found at Delphi Glass. This a top of the range cutter it is ideally suited for stained glass work, it has a 360 degree pivoting cutting arm with an inbuilt oil fed cutter that will produce an amazing variety of curved shapes. This cutter can make a 42”straight cut. The cutter is foam covered and the maker claims you can cut whilst sitting down. It will fit a waffle grid or can be used on a workbench as it has rubber feet. A circle cutter and glass strip cutter can also be purchased for this system. It is sold separately or can be purchased with the circle cutter, glass strip cutter and a waffle grid. Further information on the Ultimate Cutters Mate Starter Kit can be found at Delphi Glass.